How Militarized Are California Police? 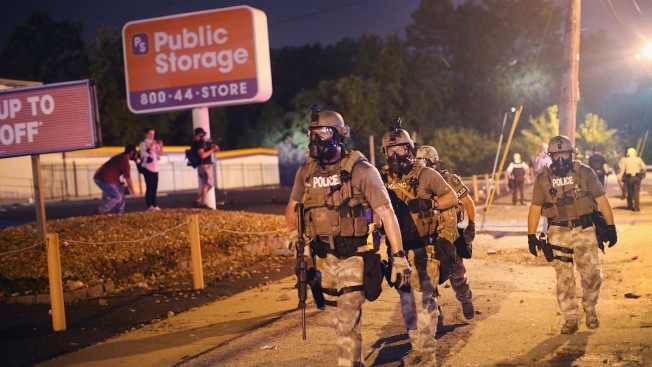 Police in camouflage carry rifles in Ferguson, Missouri. In the wake of protests in Ferguson, Missouri, a conversation is sprouting about the "militarization" of police in America. In images distributed by the news and social media over the past days and weeks, its sometimes become difficult to distinguish between Ferguson police and actual military forces deployed in international conflicts. Now, even Congress is having second thoughts. Tuesday, the Senate Homeland Security and Governmental Affairs Committee held a hearing on the oversight of federal programs which arm local police with military surplus weapons. Police have been acquiring and using military gear for more than two decades. What makes it possible is a Department of Defense program called the 1033 Program established in the early 1990s. It permits the federal government to transfer to local law enforcement agencies surplus military gear including rifles, vehicles and body armor. Usually, local agencies pay only shipping costs. Then, 9/11 provided a new rationale for military disbursement: domestic terrorism. The wars that followed helped provide the supply as new military gear replaced the old. According to data from the Defense Logistics Agency, most counties in the United States have obtained some form military surplus equipment from the 1033 program. The New York Times mapped it in a fascinating interactive graphic. A screenshot of the New York Times' interactive on 1033 data. 1033 data on the county-level has been widely available for a few weeks now. Data showing inventories for individual agencies was only just released last Friday by the California Office of Emergency Management. The NBC Bay Area Investigative Unit will be poring over those documents in the coming days. A lot of the 1033 gear local police obtain resemble the kinds of things one might encounter in an actual military surplus store: clothing, luggage, flashlights and camping supplies. But it also includes gear more often seen in an actual theater of war: grenade launchers, armored vehicles, aircraft and assault rifles. In California, the counties that have most used the 1033 program are in the south: Los Angeles, Ventura and Santa Barbara counties together have obtained more than $50 million of military gear. According to the just-released agency-level documents, the equipment includes five helicopters and more than 3,000 assault rifles. In Northern California, Sacramento is the stand-out. California's capital boasts more than 1,000 assault rifles, 14 helicopters, eight grenade launchers and an airplane. Click here to see a map of 1033 data in California. Counties that don't make heavy use of the 1033 program can still get some impressive equipment. Even in the Bay Area, where 1033 use is relatively low, mine-resistant vehicles can be found. 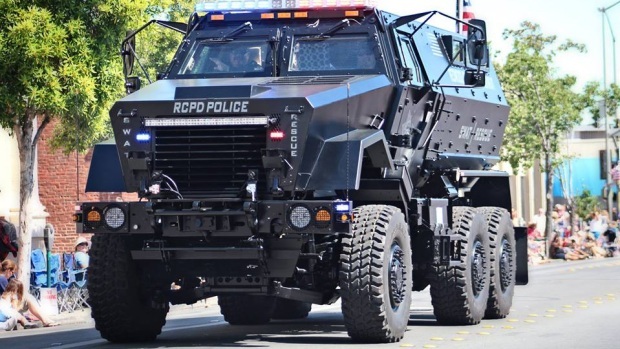 A mine resistant vehicle obtained by the Redwood City Police Department from the Department of Defense. According to the San Jose Mercury News, the vehicle weighs 30 tons and cost the federal government $750,000. In Iraq and Afghanistan, it's usually known by its acronym, MRAP: Mine Resistant, Ambush Protected. Despite the relative absence of mines in the Bay Area, the vehicle is relatively popular. The Redwood City Police Department clearly has one, but so does the Napa PD, and South San Francisco. San Jose PD obtained an MRAP as well, but returned it this summer. All told, the latest data shows that 41 MRAPs are in the possession of law enforcement agencies in California. In terms of cash value, California gets more 1033 gear than other states, but it's also got a very large population and a ton of law enforcement agencies. It's interesting to look at how the states compare year-by-year. We've charted that data below from 2006 to 2013. 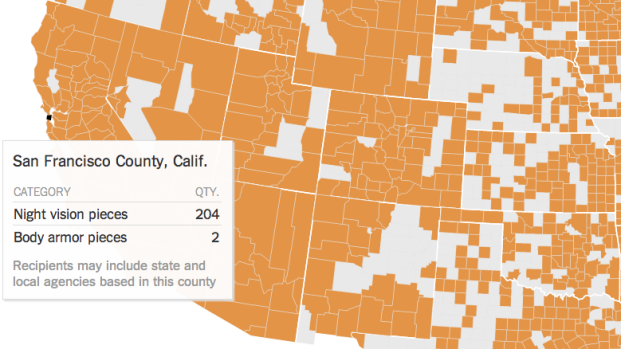 Usually, California sits somewhere near the top. But in other years, smaller states acquire far more. Watch Florida in 2010 and 2011, or Washington, DC in 2008.